I use ganache more than any other recipe in my arsenal! So when I was asked to teach at a chocolate extravaganza I though sharing the three uses of Ganache would be perfect! Lets start out with the basic Ganache recipe – chocolate and cream! Thats it! 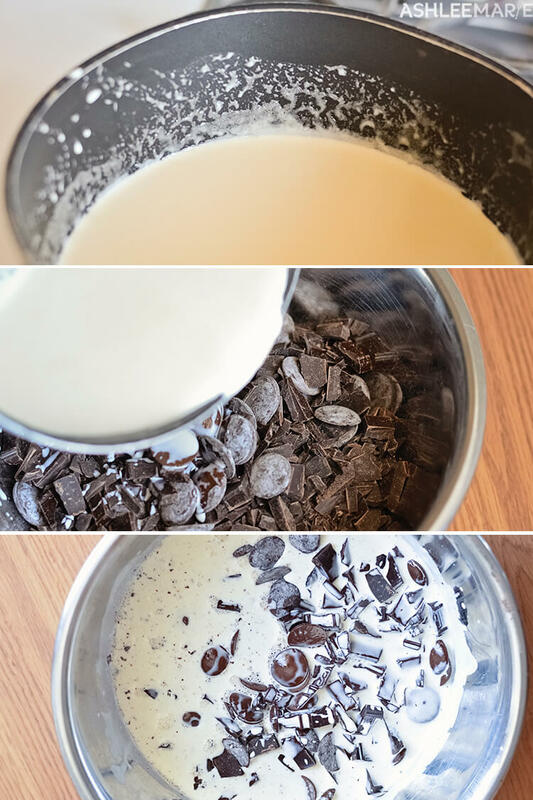 The normal ratio is 2 parts chocolate to 1 part cream, but you change it up a bit depending on what your making. Start with your chocolate. First off – go by weight. a single batch for me is 16 oz chocolate 8 oz cream. Ganache will taste exactly like whatever chocolate you use to make it, so the higher end, nicer chocolate is best. STAY AWAY FROM CHOCOLATE CHIPS, they have an extra ingredient to hold their shape in higher temps and do NOT make good cream. I like to mix 3 different chocolate brands so the end result isn’t a clear “oh this is dove”. I also like to use 2/3rd more expensive chocolates and then 1/3 I feel I can go cheaper without ruining it. And DARK chocolate makes better ganache than milk; semi-sweet, bittersweet and Dark all work best. Milk is just too soft in my opinion, not the right texture. You can DIP it in milk chocolate if you want to! Measure out your cream and bring it JUST to a boil, a little bit of bubbles on the edge and your done. Watch it carefully and don’t burn it, you don’t want your chocolate to taste like burnt cream. Nasty. Pour the heated cream over the chocolate. Shake your bowl to settle the chocolate so it’s all covered and let it sit for 5 mins. When the 5 mins are up slowly stir the cream and chocolate until it’s all incorporated and smooth. IF for some reason you have a lot of chocolate chunks (as in your chocolate pieces were too big to soften enough in the heated cream) you can save it by placing the bowl over a pot of boiling water (double broiler style) and stir until it’s melted, you’ll just have a longer cooling time later. WARNING: make sure everything you use, spoons, spatulas, the bowl, etc.. are DRY any water at ALL will make the chocolate SEIZE, and there is no fixing that. Now what to do with the Ganache! Warm, you can pour it, cool you can whip it up and use it as frosting and cold you scoop it into truffles! Here you can see the warm, dark, ganache and below the cooled whipped ganache I use for frosting. 1. You can use the 2 part chocolate 1 part cream, but for a thicker frosting (that holds piping better) use 3 parts chocolate to 1 part cream. 2. let it cool enough before whipping, otherwise you’ll be whipping without thickening a long time. 3. the more you whip it the lighter the color will become, I think I over-whipped it a big above, it still worked great, just created a more dull look to the cake. Let’s start with frosting. I use ganache almost exclusively under fondant. Once it sets it holds the shape and form of the cake so the heavy fondant doesn’t weight it down the way butter cream squishes out the bottom! I love it. 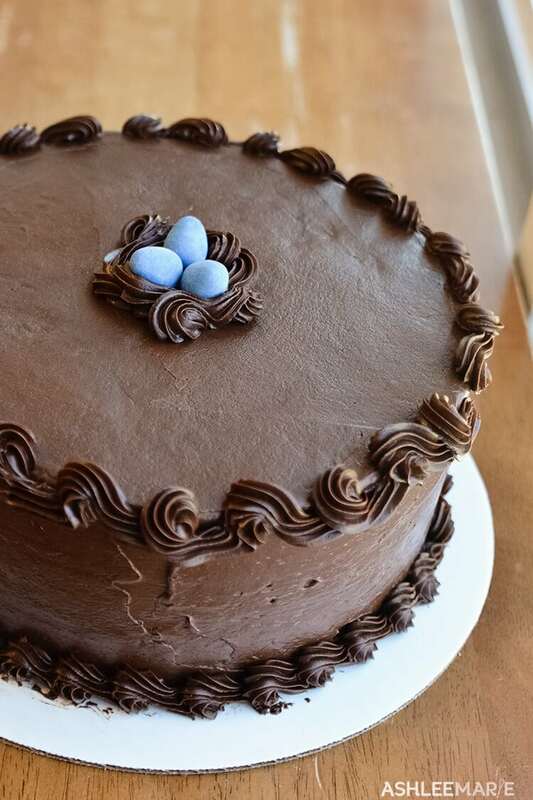 This Easter cake I made is covered in whipped ganache and then all the pipping is done with the ganache as well. You can see this is darker than the other frosting, I didn’t whip it as much. 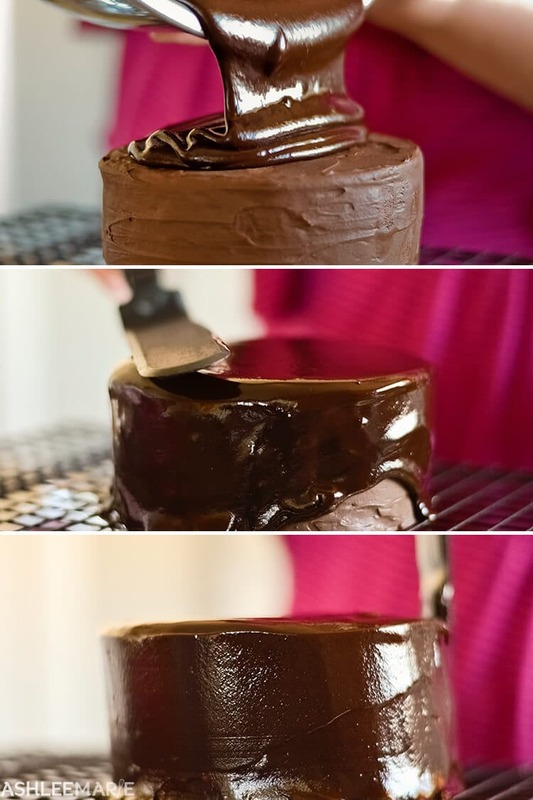 Now pouring, you can pour just a little on top, and get the dripping edge look, or pour it over the whole cake to get a glossy dark chocolate look. For the full cover I put the cake on a cooling rack with a cookie sheet underneath to catch the excess. now as I started to pour this I realized it was a bit thick. To get the smooth pour I’d use 1 1/2 parts chocolate to 1 part cream, a bit runnier, it will be thinner but set well. As well as the sides, boo… so it’s not quit the high glossy look I prefer. I should have thinned it down a bit before starting. Once you start manipulating it with the spatula it loses the effect I like. And tuffles!!!! Once you finish your gananche just toss it in the fridge! once it’s hard you scoop out your truffles, and roll them into circles. I like it best when I use a mini scooper, but mine broke and I haven’t replaced it yet! To get a different flavor change the chocolates you use, I think semi sweet and dark chocolate work the best, I’m not a fan of the milk chocolate for ganache. You can add oil based flavoring (not water- it will seize) or while your heating the cream you can add vanila beans or mint leaves or anything else you like to steep and bring out the flavor. Or you can add chunks of toffee, nuts, or anything else to the ganache while its warm, and it will mix in so when you scoop out the truffles it’s already in there! And place it on parchment. I can’t seem to do this part as pretty as others. Once it cools I break off the excess messy parts! If you want anything on top, crushed nuts/candy, sugar, salt, etc… make sure you sprinkle it on while it’s still wet. once it’s dry you can decorate with melted chocolate if you want. So that’s ganache! I usually make a triple batch every week, or more. Any extra I have after frosting a cake I refridgerate. To use it again I either bring it to room temp and whip it up a bit again, or I melt it over a double broiler to get it warm or I scoop it out and turn into truffles! I use ganache in three ways - frosting, pouring and truffles - Here are tips and tricks for each use! Mix about three different chocolate brands for a unique flavor. (2/3's nice chocolate, 1/3 general) Stay away from chocolate chips, they will not melt properly, and milk chocolate, which is too soft. Measure out your cream and bring it JUST to a boil. Burnt cream tastes NASTY! Pour the heated cream over the chocolate. Shake your bowl to settle the chocolate so it's all covered and let it sit for 5 mins. When the 5 mins are up slowly stir the cream and chocolate until it's all incorporated and smooth. you can totally do it! can’t wait to see a final result! Well everywhere I look I see that chocolate,but I live in Canada and we have a product called grenache but that is more or less like a spread or thick syrup and I was tempted to try it a few times because I was unable to get a good and easy recipe such as the one you described.Can not wait to try it and I will let you know.I have just started classes for decorating and I do follow you a lot because things are explained very well.Keep up the good work. thank you so much! Good luck with the classes and have fun! PINNED! Love this. Thanks so much! you are so welcome!!! Can’t wait to see what you create with it! I probably shouldn’t have read this first thing in the morning. Now I need chocolate. 🙂 Amazing pics Ash and a great tutorial. right????? Why do you think I haven’t lost any of the “baby” weight… I make this at least once a week!!! I eat chocolate at every meal at this point I think. And thanks, about the pictures, I’ve been working hard to improve my food photography. Ashlee – what awesome ideas! I tried making truffles once and they never got hard enough to roll or do anything with – but I have no idea what mixture/ratio I used – anyway, do you do 2-1 for the truffles or a little more chocolate? Yes, I do the 2-1 ratio for the truffles. And you can totally still do the 2-1 ratio for frosting too. Let me know if this recipe works out for you! This is the best ganache tutorial I’ve ever seen! Now I’m actually feeling brave enough to try it! YAY! I love hearing that! I can’t wait to see your results, let me know when you try it! It’s much easier that it seems. Hello! Yum! I can’t wait to try some ganache. Thanks for showing me how to use it. you are so welcome! This is totally what I used under the fondant on the Cinco De Mayo cake that you got to enjoy last year! let me know how you use it! I have never used ganache but have always wanted to – thanks for your recipe/tips! you are so welcome! it’s seriously so versatile and I use it all the time! I’m glad you enjoyed it! YES! Everyone needs to try truffles 😉 they are so amazing. I’ll be looking for truffles on your blog in the future! Pinning this for sure, I’ve needed this tutorial! The drippy kind is my favorite look – I’m going to have to try it. Mmmm the drippy kind is fun, cause it hides a lot of frosting mistakes too! I need chocolate!!! It looks so delicious! I’m pinning! And gluten free!!!! Yay! And when you live far away from me and can’t get some of my flourless chocolate cake you can make a batch of these! Wow, you make it look so easy. Thanks for the information. thanks! But in truth it really is easy, a few simple tricks (like the no water, and use a double broiler if you have chuncks) and anyone can do it! I’m having some serious chocolate cravings… I’d like for you to stop whatever you are doing today and come make me this cake! I’ll expect you here in twenty minutes! you are the cutest! I, of course, have a batch of ganache in the fridge, and a cake in the freezer, so come on by and we can frost one for you (oh and ice cream in the freezer)… you know anytime you stop by I’ll have something for you! Stopping by from the Mom it Forward Facebook Group – I pinned this and can’t wait to make it! I just came from the pinners expo at the sandy expo center. I was in your ganache class. HOLY COW what an amazing chocolate cake recipe. Do you give out the recipe to make just the cake?? thank you so much! And no I don’t. I do share a lot of recipes, but my cake and frosting recipes are not something I share I am working on getting a cookbook published with my cake recipes, but I’m not quite “big” enough to get a deal yet, working on it though! 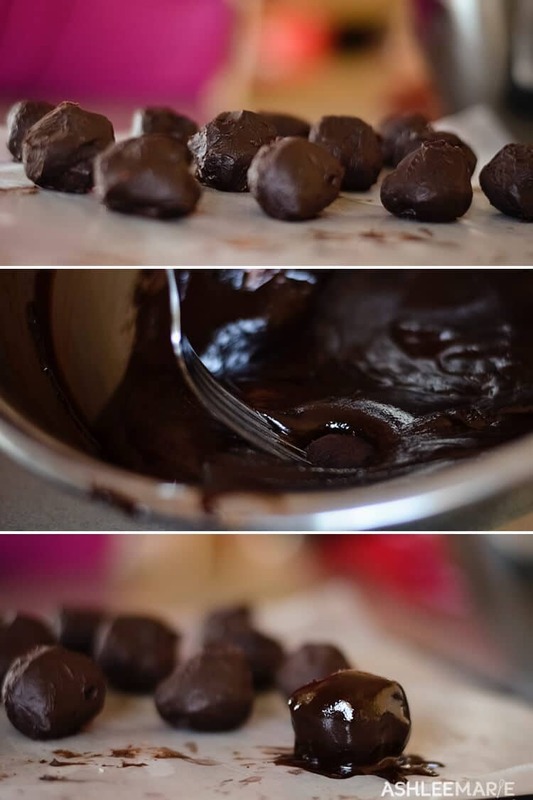 If you are adding flavorings to the truffles (i.e. hazelnut liqueor) how much should you add? Assuming 16 oz of chocolate and 8 oz of cream. Do you add 1 drop? 1/2 teaspoon? Do you have any guidelines? I am unfamiliar with using flavorings, and I don’t want to overdo it. I add the flavor to the cream as it’s heating that way it’s easier to incorporate than trying to mix once you’ve added the chocolate. As for amount, it depends on the flavor and your preference. So it takes some playing. I’d start with 1 tsp per cup for extracts, 1/2 tsp per cup for emulsions (stronger). But try a batch and see what you think. How many truffles does your “single batch” make? It totally depends on your scoop size. I’ve never counted, I made 120 the other day, but now I don’t remember if it was a single batch, half batch or double batch! I rarely make this size batch, I’m always making HUGE batches cause I go through so much of it! Thanks for sharing your crochet patterns. Have you thought about putting the truffles in the fridge and rolling with your hand to get them more round? You would need to work in small batches due to them melting from the warmth of your hands. Your cake looks delicious. I usually use a scoop, but the day I was at my sisters I didn’t have one and I was in a hurry, thus the messy pictures (she has better light but I’ll try to remember my scoop next time I’m at her house and take some more pictures. I HATE fondant and so does my family. So I love experimenting with ganache recipes til I find what works best for me. I love the tips and yes. I agree with the patience it takes before whipping the ganache. I know that I have made that mistake before. It was still too runny to work with. I also agree with good quality chocolate. I have worked with a lot of different kinds until I found what I liked. Thanks for posting this up. It’s really helpful to have as backup. Sounds great! I’m going to make frosting with it…Wondering if I can use homemade chocolate instead of chopping a store bought bar. I usually make it with coconut oil (or cocoa butter if I have it), maple syrup and unsweetened cocoa powder. If so, can I mix it with the hot cream while the chocolate is still warm, or do I cool it first? Thanks!! I love making fun cakes for my family so I was excited when my 5 year old asked for a Merida Dall cake. That’s how I found your page. 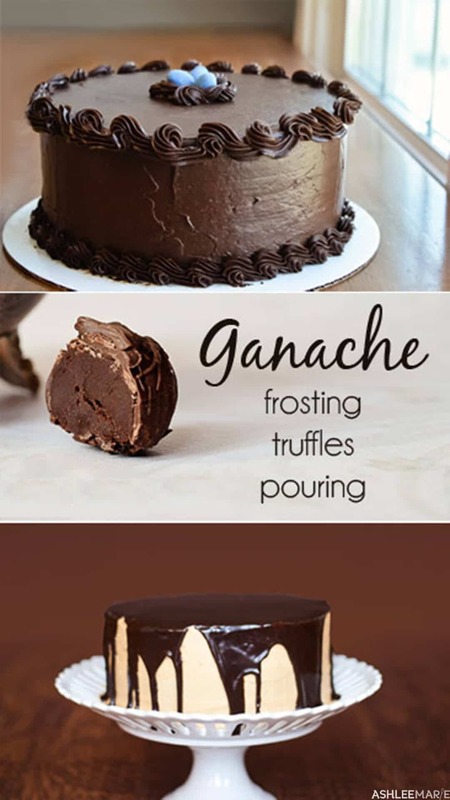 I would love to give ganache a try. One question. I use Almond bark for most of my chocolate recipes, I’d like ti know if you think it would work for this recipe. the better the chocolate quality the better the ganache will work out. I like to mix my chocolates and will sometimes mix 2 higher quality with 1 lower quality to save some money, but I wouldn’t just use almond bark. BUT I’ve also never tried it, you could play with it, you might have to up the ratio though. But you might also waste a lot of ingredients trying it. Ashlee, thanks for the great tutorial! Just made it and it turned out great! Using it for filling in my son chocolate marbled Avenger themed birthday cake! yay! 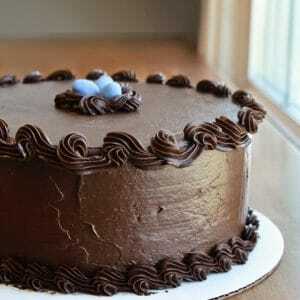 I love to hear that, I love ganache, and glad you enjoyed it too! thank you so much! I’m glad you enjoy the site and I love being a teacher! enjoy! Love, love, love thw tutorial! I have been trying for a thicker ganache for piping and never quite gor it until you explained the amount of chocolate makes it thicker, thank goodness for people who share their skills and knowledge! I had a problem with my chocolate not melting entirely tho and was too rushed for a double boiler solution so I just popped the whole thing in a microwave for 30 seconds and it worked like a charm. Thank you again for a great tutorial! Hi, your ganache sounds wonderful. What type of cream should I use? There’s light cream, heavy cream, and whipping cream. Looking forward to trying this! Thank you for sharing. I use heavy or whipping cream always, they both work great. I love this recipe , but I’m not too much into dark chocolate will this work for white chocolate ? I am tempting to make this gnache for the first time, and im planning on using it to make the Gruff cake like you posted on Youtube. How much gnach did you use for that cake?? GAH, no idea, I keep ganache around forevery so I always mix old batches and new batches and I always make extra since it keeps so well. It was probably around 16 oz cream 32 oz chocolate? Can you freeze ganache? I want to make a Buche de Noel for Christmas and want to make the cake, filling and roll into a log and freeze ahead of time. Wondering if the cream in the chocolate will freeze well? you can freeze ganache, but you don’t want to freeze fondant (if your covering it). Hi Ashlee. Thank you so much for your information. One question though, i want to cover a whole cake with ganache, so how long do you have to wait until you can pour onto your cake? Does it have to have cooled down? ummm that depends on the amt of ganache – it’s a hard one to answer. I usually make my ganache a few hours before I need it, up to the night before. leave it on the counter and let it cool to room temp. if you refrigerate it it will stay warm in the center and get too hard on the outer edges. I have been so intimidated by ganache for so long that I never attempted to try. This gave me a sense of I can do it! Thank you so much! I can’t wait to see what you do next! I do have one question, when you pick your chocolate, do you like 60%, or 100% cocoa better? Do you mix different percentages? I found the 100% a tad bitter. What do you think? any chocolate you’d want to eat cause the cream isn’t going to make it any sweeter. Personally no I don’t stick with high percentages – dark, not milk chocolate but not crazy bitter. What kind of chocolate? Brand? Thank you, this is super helpful! Am I able to use pouring ganache over the top of whipped ganache? I want to make a chocolate cake with a filling and coat of the lighter whipped ganache but then cover it with a glossier surface like the pouring ganache. Two different textures but without over complicating the flavour. Any tips to make it work? Would you mind sharing which chocolate you used in your photos above? Some of it looks like chocolate chips but I know you said to stay away from those. Thank you! What method do you use for whiping the ganache; whisk, stand mixer or hand mixer? The cake I’m making will be too large to fit in the fridge…is it possible to poor white chocolate ganache over an UNchilled cake? If yes…then how? Thx! are you looking to pour over the whole cake or just create drips? for just drips use a 1 to 1 ration and let it cool to almost room temp then use a piping bag or something like this http://amzn.to/2xYYt3e to get the drips. For full coverage I wouldn’t use white chocolate as it becomes kinda cloudy transparent when turned into a ganache. I’d consider doing a mirror cake in that case, which is different than a ganache glaze.